It took me a long time and hours of practice before I perfected my makeup artistry. You only really learn by trying out different techniques, products and colours, to get to know your skin and find out, what makeup suits you best. I am going to start off by guiding you through an easy, step-by-step guide to applying makeup and this routine has never failed me and has always had me look pretty good and one might say even beautiful and totally attractive. Hide Your Imperfections: Use a concealer in your normal skin tone to hide any possible dark areas, rings under your eyes, spots, skin blemishes or broken veins. Apply Foundation Carefully and Evenly: There is nothing quite as ugly as badly applied foundation that looks streaky and uneven. Make sure to choose the right color and grade for your skin type and apply it evenly, never in excess. If you find it too heavy, lighten it with a bit of moisturiser. Colour for Your Cheeks: Sometimes I use blush, other times I don’t, it all depends on the weather, the time of year and where I am about to go. If you are using blush, apply it with a brush, starting in the centre of your cheekbones and moving up towards the corner of each eye and remember, less is more! Shimmer Your Eyelids: Just apply a small bit of light shimmer to your eyelids, it will brighten up your eyes. Add Some Colour: Carefully apply your favorite eyeshadow, on the eyelid and underneath. Mascara and Eyeliner: Add definition to your eyes with mascara and eyeliner, enough to emphasise your eyes, not too much to make you look scary! Lovely Lips: By now you probably know what colour lipstick suits you, just make sure it blends in well with your own colouring and the rest of your makeup. Not only clothing is seasonal, there are just as many trends in makeup and if you’d like to know what’s hot for this year, read on! Black Cat Eyeliner is Out, Thin Pencil Eyeliner is in! : Just as you have perfected the art of drawing those cat lines, you have to move on and forget about them! This year is the year of pencil lines along the waterlines of your eyes, discreet and beautiful. Super Glossy Eyeshadow: Glamorous glossy, colourful eyeshadow is in, don’t be afraid to use bright, thick, colourful eyeshadow, it can actually look stunning. Exaggerated Blush: Very bright, lilac blush that covers your cheeks and a very wide area all the way up to your eyes and even covers your eyelids is fashionable this year, though I am not sure I really like it. Metallic Eyes: Cold, silver eyeshadow is also trending this year, making you look very cool and sophisticated indeed. This particularly suits women with blue eyes as the silver and blue combined maximise the beauty of your eyes. 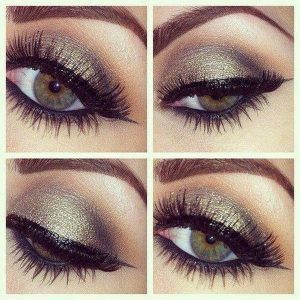 Glittery Eyes: Last year saw the emergence of eye glitter for your eyelids and underneath your eyes and that trend is continuing with the slight variation that it can be applied quite messily this year. Hot Red Lips: This year we the introduction of hot red lipstick and a move away from heavy makeup. Bright red lipstick is worn with a very understated foundation and virtually now eye makeup. Interesting and new! You can learn so much about makeup by just looking at other women and deciding, what type of makeup you like. Don’t be afraid to experiment, that’s the only way you will ever find out what really suits you while also learning how best to achieve your perfect look. Give it a try, I know you are a makeup artist in the making!